A little over a week ago, I had written that we had been really distracted here and thrown a bit off schedule. Since the loss of Tigger and Shadow, I have been following a number of rescues and looking at Petfinder.com for rabbits. I wasn’t really looking for a rabbit right now as I thought it might still be too soon. There are belongings here in the house from Tigger and Shadow that need to be cleared away or bleach cleaned and the rooms with carpets need to be steam cleaned or have the carpeting replaced to be more sure that a new rabbit isn’t exposed to common rabbit illnesses that can be contagious. Instead, I was looking for shelters or groups I wanted to keep an eye on for a bunny down the road. That is until I saw the picture of Leo the Lionhead who was at a city shelter within a few hours round trip drive. His picture called out to me in a way that no other rabbit photo had since the time I had seen our bunny Portia on a rescue site and had to meet her. 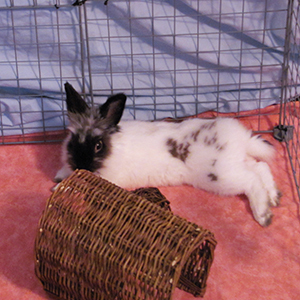 Leo had been described as a personable, male Lionhead rabbit, neutered with an estimated age of a year and a half. We were told his original owners had surrendered him to the shelter because they worked long hours and weren’t able to give him enough attention. It saddened us to hear that he had not really been given a name, but had been called Mr. Bunny, but not even enough by that to recognize it as his name. The shelter thought Leo was more fitting, but told us he wasn’t used to that either, so we could still change it to anything we wanted if we adopted him. 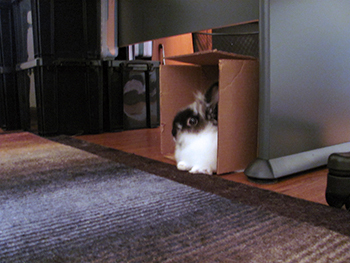 We thought Leo was a great name for a little Lionhead. Leo was just as cute in person as his photo had been, very active and he liked to have his head petted and started begging us for attention quite quickly. He had two scabbed over healing wounds in his side that were thought to be from Fly Strike which can be deadly for rabbits. We were concerned about the status of the wounds and the staffer helping us took him to see the vet who was there at the time to verify the care still needed. We didn’t realize we should also have asked that they check that Leo was actually neutered as advertised. In a nice game of who has the ball, the answer is Leo does. He has two of them actually, even though he wasn’t supposed to have any. So the cautionary tale here is if you are told a male rabbit has been neutered, flip the bunny over for a double-check looky see. Blaine said it must have been really cold when Leo was examined for his nice little set to have been missed. We trusted the staff and didn’t try to do a full exam on Leo ourselves since we had planned to take him to our vet for a well check right away. So, surprise, surprise when our vet turned him over and we had an obviously intact male rabbit. He has been scheduled for surgery later this week. Neutering a male rabbit even if he is your only rabbit can be a big help to curb territorial spraying, aggressiveness and other bad behaviors and lessen the smell of the urine. Leo isn’t spraying or aggressive, but whoa, he is a stinky little fellow first thing in the morning when we let him out of his cage. 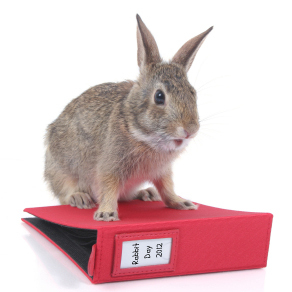 So once again, we seem to have a truly Rabbittude rabbit on our hands who was trying his best to keep a few things secret and hidden. Leo is going to be our office bunny for now. We had one room in the home, one of the largest, that we had completely renovated to move our home office into. It had been newly painted with a new floor installed. We had just moved the office furniture and equipment in. So little Leo now has a brand new cage and exercise pen there. We will look to give him access to other areas once we have gotten the carpets cleaned or replaced in some rooms. Since it turns out Leo needs to be neutered, there will be some time where he will need to be a bit less active anyway while he recovers. So we have opportunity to get more running area ready for Leo. We are just getting to know Leo and find out just what his tales will be and hope to have many to come down the road. He is just so cute, we hope he will make it through the neutering surgery safely without any issues and won’t be too mad at us for being the ones to bring him in for that. 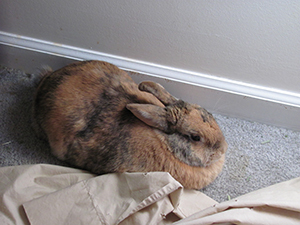 It is one of the reasons we were looking for an already altered rabbit, so that we would not have an issue of a rabbit associating us with pain and medication right at the start of our relationship.